I do a lot of restaurant work and importing Revit files of kitchen equipment in VW2017 has been really helpful. When I import that same files into VW2018, I get very poor results. Sometimes I get part of the model, or I get random objects and sometimes I get nothing. I've never gotten it to work. I tried attaching a file but this forum doesn't accept RFA file types. So this is a webpage where you could download an example of an underbar refrigerator: http://truefoodservice.kclcad.com/Mobile/?search=TBB-24-60G-S-HC-LD. I just sent a file to tech support that wouldn't import. Granted it is 200MB+ and will grow fast as we are just in SD. I suggest calling them! Also your signature line says you are on VW2016. If you ZIP the file then you should be able to attach it. Just tested your Revit file as well as the one from the link imported as empty 2D symbols and records in VW2018 but imported fine in VW2017. It is similar with your Revit file. The elements layer that is in VW2017 is missing in VW2018 so it seems that something is wrong with the VW2018 Revit import as the issue remains somewhat similar regardless of settings. I can see it importing objects and the outlines sort of show up but once the import is completed all it shows are several empty 2D symbols and some records. I think you should submit this file to tech support with the VW2017 and VW2018 import results as well as the VW2018 Revit import settings along with it so that they can see the difference. How do I submit something to tech support? Last time I found a bug with dormers in the VW2018 roof PIO just posted here and an employee responded. It depends on where you are located and if you have VSS or not. 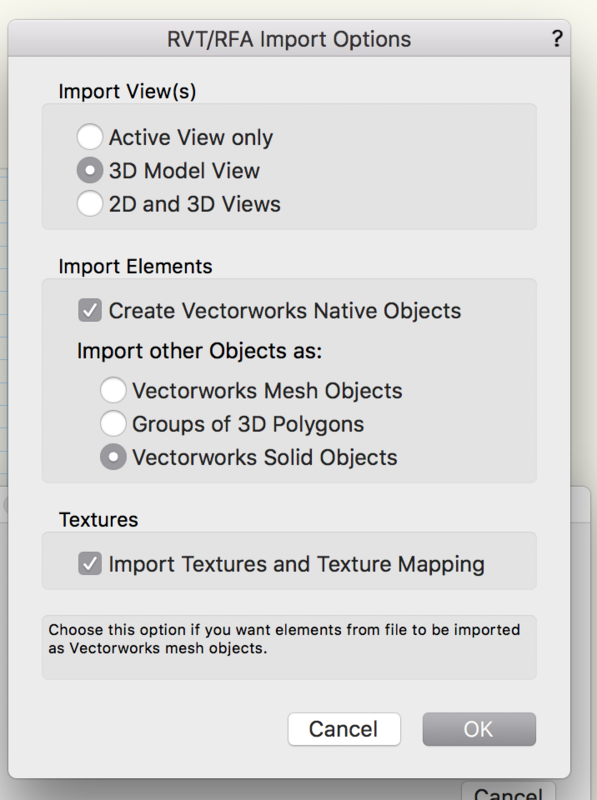 - If you have a VSS (Vectorworks Service Select) subscription then you should login to your VSS portal and use the support request option in there for priority support. - At the bottom of these forum page are three columns with links, the middle column being for support. Either use the Tech Support Request link or the Bug Submit link depending on whether you think this is a plain support issue or a bug. Thank you. I'm sending a Support Request Form over VSS now. 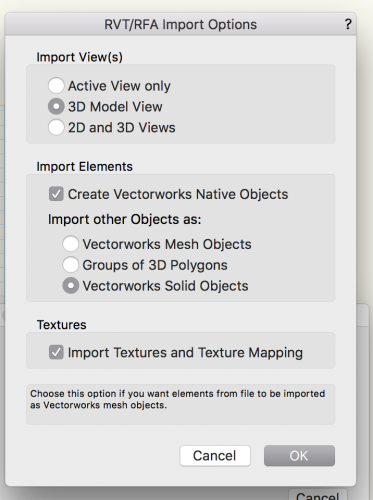 I believe that Import Revit is exclusive to the Design Series modules of Vectorworks as well. Do you still not see it after importing and then immediately using View > Zoom > Fit to Objects when importing it into a new blank file? Nothing shows in the Resource Manager either? @JimW It doesnt for either of those. It cant be the file either as ive tried with some other files too. what else do you reckon it could be? Not sure, I recommend sending the revit file to tech@vectorworks.net and having them take a look. Sent a file 6 months ago... still no fix. Here's a workaround I've been using. I import it into VW2017, save it, then open it up in VW2018. I'm referring to your other problem - when you import into 2018, you see the object(s) flash on the screen, but then there is nothing there (or only partially there) when it is finished. It's been almost a year since I reported that the Revit import was broken in VW2018. It remains broken in VW2019. To import a Revit file, I need to open up VW2017, import Revit file, save it, then open it in VW2019. It works, but it is a hassle. Any chance that this will be fixed in an upcoming SP? Marked for fixing in an upcoming service pack, yes, but I do not know if the fix will make it into anything other than 2019 since 2018 has now had it's last service pack. I'd be very happy if this was fixed in VW2019. I would prefer only running a single version. Your problem is fixed for VW2019 SP3. @Vasil Kitanov That's fantastic! Looking forward to the SP3 release. @Vasil Kitanov Revit import still doesn't work after SP3. I tried to import this, and it didn't work.